Beschreibung "Information Duties. Japanese and German Private Law"
Special Issue No. 11 of the Journal of Japanese Law celebrates the 20th anniversary of the founding of the Journal and presents an up-to-date and comprehensive analysis of the role information duties play in private law in Japan and Germany. Information duties have significantly increased over the last thirty years in both jurisdictions. Their underlying concept can be described as legal duties to provide, share or make available certain information. This concept has become the basis for regulation in various areas of private law. 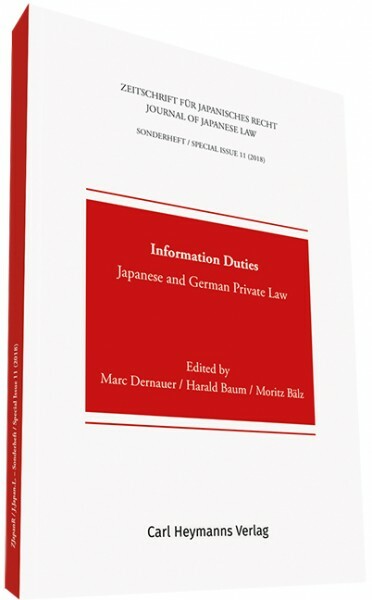 Leading private and commercial law scholars from Japan and Germany classify the manifold types of information duties and shed light on their differences and similarities from a theoretical as well as a practical perspective. The comparative analysis hopes to encourage law experts on both sides to further reflect on and (re)consider the necessity and scope of their existing information regimes.